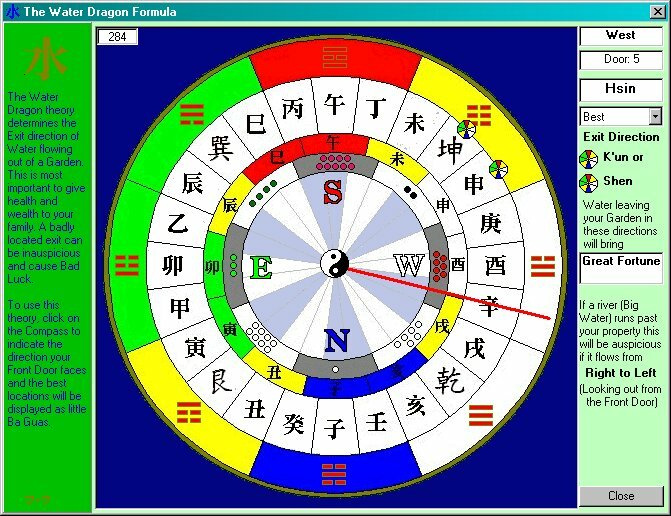 The Feng Shui Garden features provide information and calculations on all the aspects of Chinese Astrology and Feng Shui relating to Gardening. You can use the program to layout your garden using Feng Shui principles, to determine the best way to protect your property around the boundaries, to choose the best combination of plants and flowers and even to work out the most auspicious location for your pond. 1. The Feng Shui Garden Planner lets you sketch the shape of your garden and find out what would be most auspicious in each area of the garden. Also shows the position of the Four Celestial Animals on the boundary of the Garden. 2. 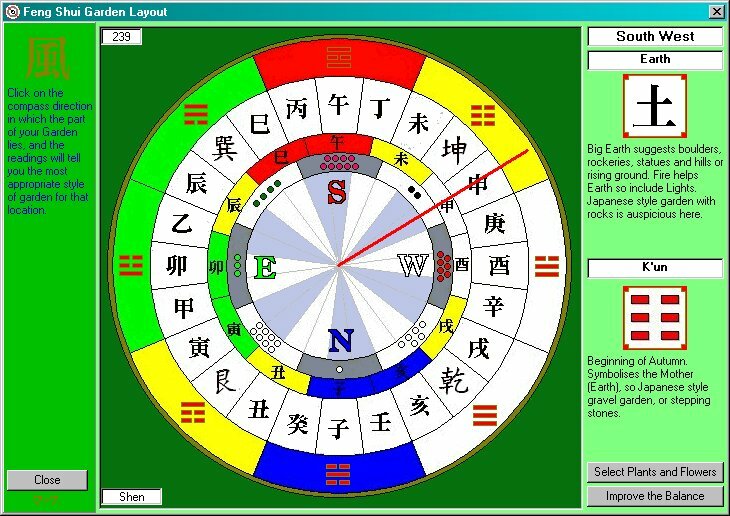 Feng Shui Garden Layout - based on the 24 locations of Flying Star Feng Shui, this window allows you to determine the most auspicious layout for your garden - based on the direction of each section of the garden. You can also display pop-up windows which allow you to select the best plants or other items to make the location as auspicious as possible. 3. The Feng Shui Plant Selector window can be called up from many of the screens, and allows you to browse through a list of selected sample plants and flowers, grouped by Feng Shui Element and Flower type. 4. 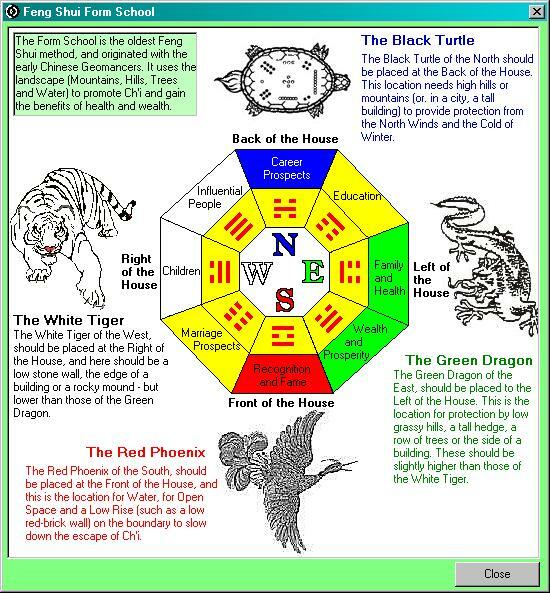 The Feng Shui Enhancements are displayed for each of the Compass School locations, and provide suggestions for helping to enhance positive areas, or to decrease negative elements. 5. 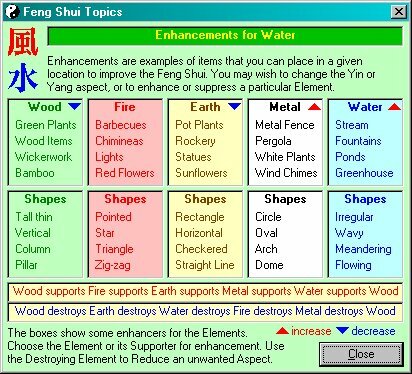 The Feng Shui Element Enrichments screen shows how to enhance specific locations using Feng Shui Cures and Enrichments. 6. The Feng Shui Water Dragon Theory screen allows you to work out the most auspicious location for your water feature, whether it is a pond, a fountain or a stream. 7. 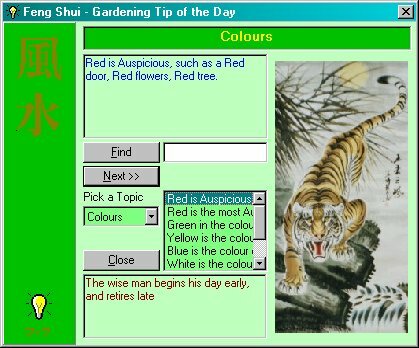 The Feng Shui Form School is the oldest of the Feng Shui theories, and this screen displays the information that you need to layout your garden to the best advantage. 8. The Feng Shui Daily Gardening Almanac shows you the most auspicious activities in your garden for any selected day - and also those activities to avoid! 9. 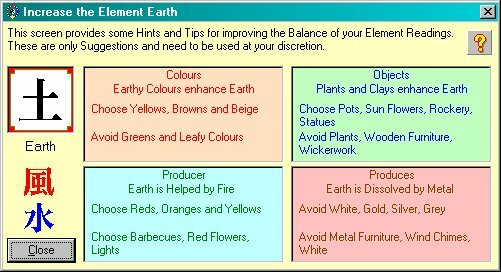 A range of useful Feng Shui Gardening Tips are also available, and can be searched using words or topics.